Victoria’s Riflebird is one of 12 bird species endemic to the Wet Tropics region. It is one of four birds-of-paradise Indigenous to Australia. This bird of paradise is endemic to the Atherton Region where it can be seen throughout the year. It is named after the British Queen Victoria. Victorias Riflebird is known as duwuduwu to the local Aboriginal people. It is a medium sized bird, 23-25cm. 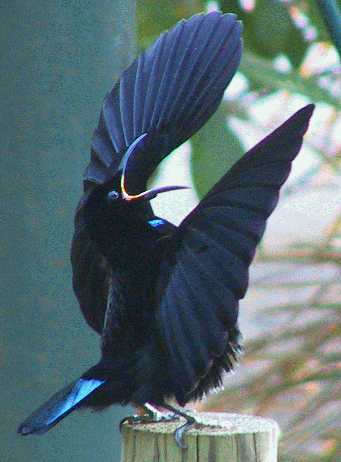 The male is a velvet jet black with a green head, throat and tail that sparkle in the suns rays. The female is a red-brown. Riflebirds are numerous around Chambers Wildlife Rainforest Lodge. In its breeding season from September to February. During this time males display from conspicuous vantage points, where they mate with any receptive females attracted there. Males attract females by their fascinating display of throwing up their rounded wings either side of their upstretched head and neck, swaying from side to side and bobbing up and down. While they do this, they flick their head from the edge of one wing to the edge of the other. They also make a loud single and explosive yah call. When they open their bill, their brilliant yellow mouth interior can be seen. The male also has the ability to hang upside down with his tail fanned and wings spread. If the female is attracted, she moves toward him in a hopping motion. As she gets closer (when he is upright) he encircles her in his wings, which he uses to tap her softly. Once the male and female have mated, they no longer remain together. The female raises their young (usually two) alone. Her nest is often decorated with snake skins (eg. python). Male riflebirds appear to keep to a territory, but females tend to wander. They have a swift and direct flight. They feed in a predominantly woodpecker fashion as they tear tree bark and rotting wood with their long curved bill, strong legs and claws. They search for insects, insect larvae and fruit. Occasionally they are shot illegally as they regularly damage cultivated fruit.